This year, from June 28 to August 02, thousands gather to watch the Montreal International Firework Competition featuring nine countries. See http://internationaldesfeuxloto-quebec.com/fr/ for the schedule and come support your country! Here are some best places all over the city to enjoy the fireworks lighting up the skies. The best place to see the firework up-close (although a bit more expensive) is LaRonde amusement park! For around 67.75$ you get a place to sit and enjoy the fireworks choreographed with music happening right over the lake. With this you also get a one day access to the rides! So if you want to enjoy the rides during the day and end the night with a good show reserve your ticket now! 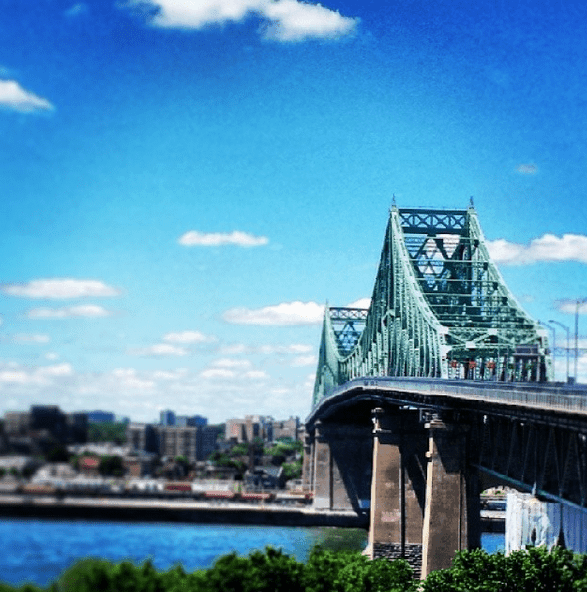 One of the most popular places the watch the fireworks for free is the Jacques Cartier Bridge accessible from either Papineau area, Ile Ste Helene or Longueil. It is closed off the traffic from 8:30 pm onwards until 11:30pm and is only accessible to pedestrians (so no bicycle allowed). The views you get is quite impressive and on top of that you can bring food and drinks! So get your foldable chair or beach towel and reserve your spot early because it’s going to get crowded!!! Feet in the sand, lights in the skies and cocktail in hand …what else can you ask for? But beware there is limited space available and it gets quite crowded, so if this is what you are aiming for, be there at least a few hours in advance. Having a view of the fireworks while sipping a drink or glass of wine from one of the best terrace in Montreal? Why not! Access is free but the purchase of a drink is required. Terrasse sur l’Auberge also offers tappas and a variety of appetisers. Book a week in advance to get the best spots on the terrasse! Enjoy the fireworks with the view of the city in the background. This is probably one of the best places to set your camera and shoot some of the most amazing pictures of Montreal and the picturesque fireworks. A bit harder to access it; but definitely worth the climb up to Mont-Royal. Picture Montreal; the sun is shining, bodies are tanning. You’re walking down a residential street. Suddenly your nostrils flutter with pleasure to the scent of burning charcoal. Soon enough, you can taste the burger-veggie pattie- fish-vegan dog grilled to perfection. Mmm, the smell of summer. And you think to yourself, I should’ve paid that extra buck for a place with a patio or backyard. Well, the good news is, Montreal is filled with parks which happen to be some of the best summer barbecue spots the city has to offer! *Evidently, they are a few rules about drinking in parks that you might want to be aware of. Sharing its extremities between the Plateau and the McGill ghetto, with its beach volleyball courts, football field and endless green lawn to lounge around, Parc Jeanne-Mance is an amazing place to host a summer barbecue. There are so many different areas to choose from and more often than not, you’ll hear tam-tams resonating in the distance, Latinos singing and young kids laughing, adding colour to your evening. If you’re seeking for more privacy and are up for a hike, the Parc du Mont-Royal across the street from there would be the perfect fit. Designed by Frederick Law Olmsted, the father of Central Park in New York City, the Mont-Royal is home to runners, bikers, dogs, medieval fighters, tam-tam players (especially on Sunday) and of course, barbecue makers. Walk up the main path and it’ll lead you to Beaver Lake (the beavers remain non-existent), further up is the Belvédère or better known as the look-out, and finally, the cross. The best areas to barbecue are mostly located in the earlier stages of the hike or around the lake. If you forget something or need to pee, the lookout has a dépanneur with a few life-saving supplies and clean amenities. If you want to get to know a culturally different side of Montreal, come by this area on weekends. Located at the mere end of Little Italy, in the heart of Villeray and reaching out to Parc Extension, Parc Jarry is where Middle Eastern and Indian communities mingle. From cricket to boce, to midday prayers and Indian weddings, to the smell of marinated meats and fresh bread… it’s a different kind of summer barbecue scene. With it’s free of cost outdoor public swimming pool, professional tennis stadium and soccer field, you can easily end up spending your whole day here. You’re craving that barbecue taste but are lacking the motivation to grill-it-yourself or simply don’t own the tools and supplies? The 8th edition of Formula Fun Tokyo BBQ is taking place this coming weekend. Every year, during Formula One, the infamous Boulevard Saint-Laurent opens its street to pedestrians while all stores, bars and restaurants try to impress each and every one of us with their best eats, drinks and wears. Make your way down to Avenue des Pins and Saint-Laurent, on the South-Eastern side of the street, 2nd floor is the place to be. Tokyo bar is hosting its annual summer barbecue. With some of Montreal’s finest DJs, you will be able to enjoy Bofinger’s grilled delicacies, shucked oysters and Tokyo’s one of a kind summer cocktails and buckets of beer. Thank me later!